Here is one representative* picture for each of the 64 dogs I have (plus a "humadog"!) I'd love to able to give them all their names, so if you know who they are do please tell me. Click a thumbnail for a bigger pic and a link to more photos of that dog. (There are 1030 photos altogether!). * 'Representative' doesn't mean 'best' or 'favorite', I just chose these to make identifying the dogs easier. 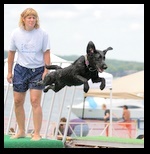 To find out what the competition is all about, visit http://www.ultimateairdogs.net/ which is run by MaraLee Richardson and Sara Chisnell-Voigt. The dogs are jumping into a small swimming pool from a platform like a boat dock. They are chasing a toy either thrown by their owner or hanging from a frame that is adjustable in height. They are having so much fun it is completely infectious and I, who have never been particularly fond of dogs have found my attitude to them quite changed after watching this amazing display of eagerness and courage and strength. 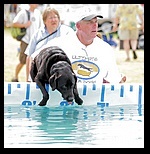 I posted 9 photos on the Ultimate Air Dogs message forum and I am proud and delighted that my photo of Colby won their photo competition for the Cherry Festival. Please contact me if you would like to buy any of the pictures. I can do prints up to 10" x 8", print-ready jpeg files at up to 8 Mp resolution (HUGE on your screen) or just the untouched files as they came from my Canon 30D DSLR camera if you want to do your own editing. I am not a pro phtographer so I won't ask pro prices but a few dollars would help persuade my husband that this is a good use of my time!